Yes, that absolutely requires three exclamation points. Y’all, as many small, behind the scenes things we’ve accomplish over the last 6 weeks–and there have been plenty–the only thing, so far, that looked like real forward progress at first glance was framing in the new wall. And that was weeks ago! But now, now I have something I can point to and not only claim ownership of (I was feeling very third wheel on a lot of the progress to date) but it signifies a major leap ahead in the finishing of the room (even though we’re nowhere close to being finished). I present to you… our floor. 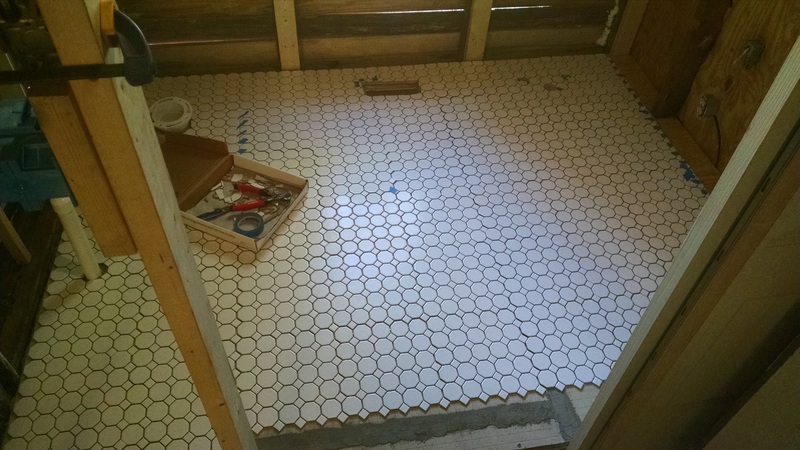 Since we laid the Hardie backer on Thursday night, that meant we could tile pretty much any time on Saturday. First, though, we needed a trip to Lowe’s for a few more things (including a bit to cut the holes for tub drain and supply lines through the cement board, since we didn’t do those ahead of time… for reasons) and then I needed to dry fit the tile. 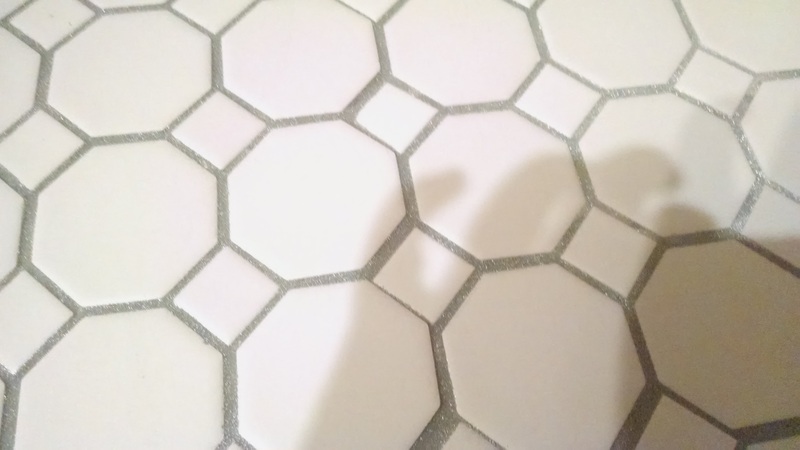 Now, our tile came in sheets but it’s not on a mesh like some of the super-small tile patterns, it’s more like strong glue spacers behind the tile pattern? Easily cut with a utility knife. I started my dry fit in the back left corner of the room (the commode quadrant, if you will) and tackled the left border of the room as this was where most of the fiddly bits were for the plumbing lines. The compound tile nippers we picked up that morning were nice and easy to work with and fitting around the pipes was pretty simple. The dry-fit, minus the part just in front of the door. Except for that first line of tiles along the left side of the room, every other edge had to be trimmed since the room, despite appearing squared off, isn’t. So it took quite a good chunk of time to fit all of the tile edges to the plywood edges, and I had to send Todd back to Lowe’s (for the third trip of the day) for 5 more sheets of tile to finish out the dry fit of the front, doorway-side edge of the room. But! Dry fitting everything meant that the actual tiling process went pretty quickly. 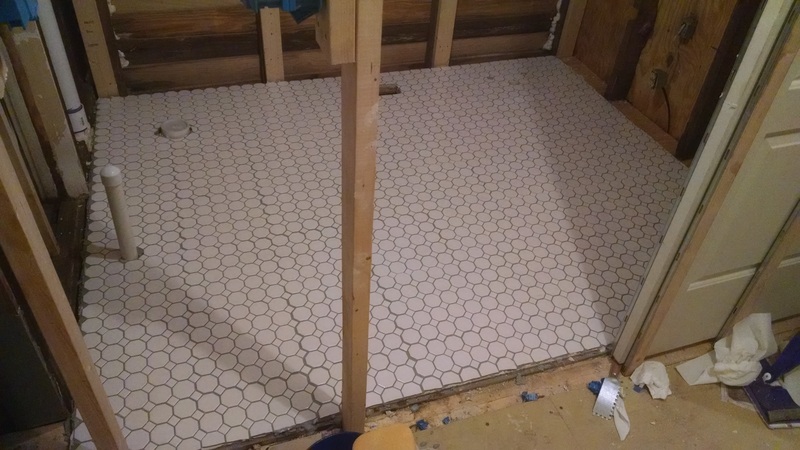 Having everything already cut, and then stacking each column of tile last to first, and stacking them in a row just outside the room meant I could lay down the mortar for a row, then grab the pre-cut tiles, and just keep on trucking. It made for a long Saturday, but it felt good to get it done! You can see where the excess mortar creates a slight haze over the tiles. It’s a learning experience. 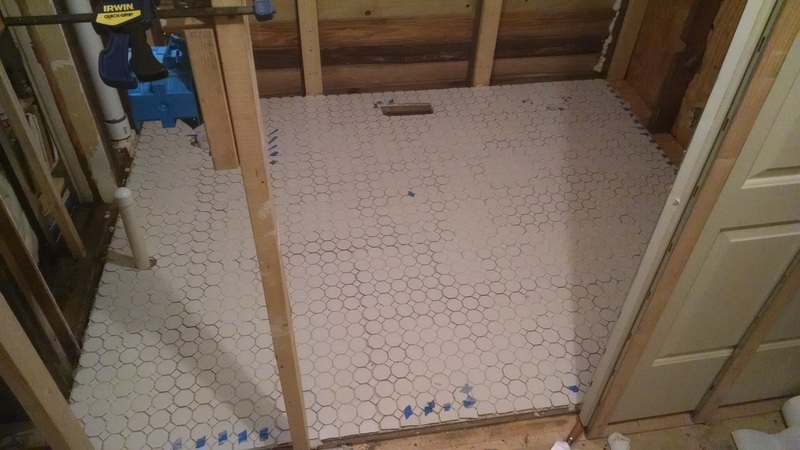 Of course, this was my first time tiling a floor, so mistakes were definitely made. My mortar application wasn’t 100% even, with some deeper pockets here and there, and the excess mortar squished up between the gaps in the tile pattern. On the first row I tried to clean up as I went, but that just made for more of a mess. I’m still not sure that was the right decision, because I spent 6ish hours or so (however long it takes to watch/listen to Fuller House, season 1–all of it) on Sunday afternoon chipping away the mortar that had squished up enough to block where the grout needed to go. At least the mortar cleaned up easily from the tops of the tiles it got onto. I’m a messy cook, and a messy tiler, too! 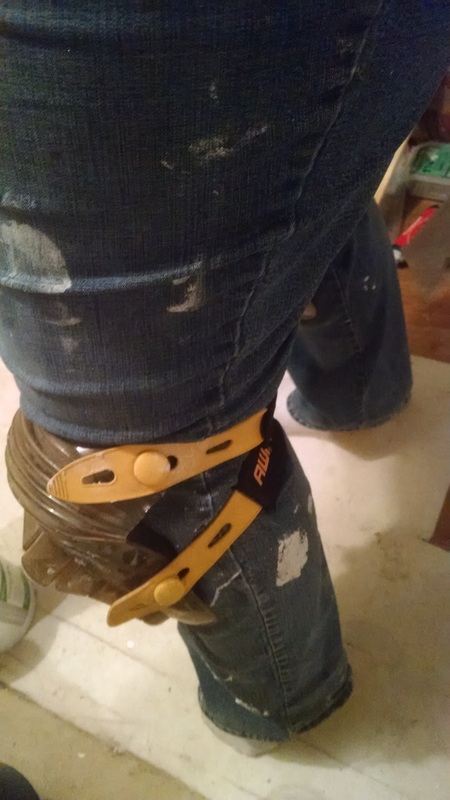 After hours of chipping away, I was no longer in the mood to grout, so Monday night, as soon as I got home, I threw on my mortar-encrusted work jeans, strapped on my knee pads, and got to grouting. Okay, a word about knee pads. We each bought pairs of heavy-duty gel knee pads for the renovation work, and I did wear mine during the dry fit and tiling. But they’re really only comfortable for a few hours. At that point it doesn’t matter how thick the gel padding is, the fact that the base of your knees and the tops of your shins have no natural padding of their own starts to come into play. And the straps of said knee pads eventually work themselves into a single spot behind your knee and start to create friction burns from the shifting as you crawl along the floor. Almost a week later and my knees still hate me. Back to grouting. The grout we chose is probably my favorite thing, so far, of the entire project. Dude. It’s disco ball sparkly! It’s pre-mixed, ready to go, and despite smelling like hair dye, it was really easy to work with. Grouting took a total of 2 hours, so not bad at all, and the change it made in the room was amazing! I mean, yes, the contrasting grout lines highlight where my spacing got off (the spaces we bought, the only ones Lowe’s carried, only work with square tiles, so were pretty much useless with the octagonal tiles that made up the majority of our square footage), but I don’t even care! 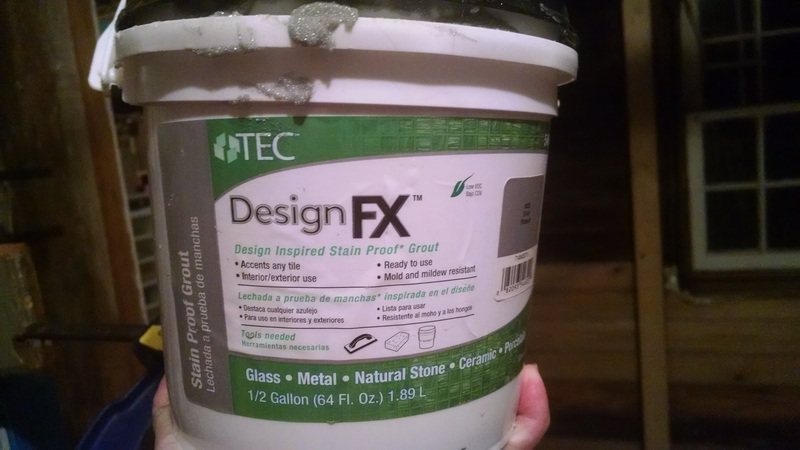 Not only will the darker grout not show dirt as easily as white would have, it sparkles! Can you see the sparkle? It’s there, I promise! Plus, most of it is going to be covered up or obscured by the tub, commode, sink, and rug. Uneven spacing is not the end of my world. Speaking of the rug situation, I totally scored at Tuesday Morning (which I visited on Tuesday night). I had some time to kill before Beer & Cheer so I popped in to pick up a couple things for Todd’s upcoming birthday party and look at their rugs. I found two that had the burnt orange color I was interested in and the approximate size, but I wasn’t sure which one Todd would like so I bought then both. Thankfully–this is TM, afterall–the larger rug was $20 and the smaller one was $15, and if Todd hated them, I could easily bring them back. 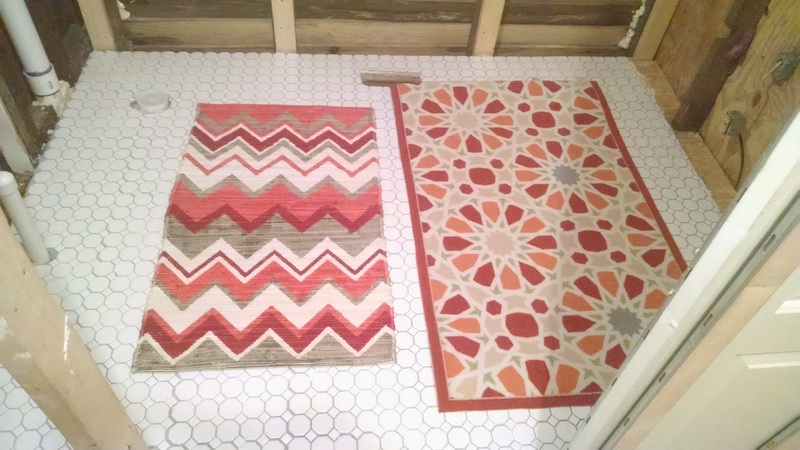 The perfect rug would be the size of the one on the right with the pattern of the one on the left. But perfection is overrated. Turns out, we like both of them for different reasons, so we’re keeping both, and we’ll swap them out at will. The larger rug is an indoor/outdoor rug, so super sturdy, which will beÂ good for when we entertain and this room gets more traffic. The smaller rug is 100% cotton, so will be easy to clean and probably be the day to day rug choice. They both have two shades of orange and the grey in each kind of picks up the silver of the grout. I’m really happy to have that out of the way and to have gotten such a great deal on them! So what was Todd doing while I was fussing with tile? He was under the house working on the supply lines for the tub, commode, and sink. Everything is now measured and cut, just needs to be assembled. Unfortunately, Thursday (when we thought he’d get home early enough to install them) he came home with a bad toothache and swelling and, yeah, not really in the mood to work. Poor guy! The goal for the weekend is to get the toilet installed and put up the wall between the hall and the bathroom (and the old doorway to my office), since that’s the bare minimum of what needs to happen before the party in 2 weeks. Ideally, we’d be able to get the sink installed, too (though we’re having trouble finding the right faucet at the moment), and get the drywall up inside the bathroom so the walls look semi-finished, but that’s technically optional. The wall also involves the insulation (which we bought this week) and installing the vent fan, so we’ll just have to see how far we can get. Here’s hoping Todd can get into the dentist today and will be feeling better soon! PS! The videos are now up for weeks 5 & 6 in last week’s post. This week’s video will be up much more timely, I hope! Thank you, Maggi! I love the idea of an exclamation point high-five, that’s fabulous!